Back to back 6 posts in Debjanir Rannaghar on review, experience, travel but not the recipe! Hmm, this is what happened this time and you may wonder why! Well, it is not that I am tired of cooking or I am busy with other things but the reason is the topic of the post I was planning for! Something I was planning to post since last 30 days or to be specific since when I cooked it last month for a special request. Somebody requested for Daab Chingri that too prepared in an authentic way as much as possible and she offered me to pay for it! It was quite an experience for me! For the first time, I did this for a friend who is a loyal reader of my blog as well as well as married to a friend of mine. It is not that I never made Daab Chingri before but the fact is I try to avoid making it just because of the entire process which is nothing but tiring 😛 . 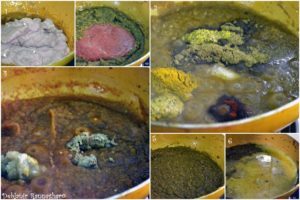 However, the surprising part is after making it for “N” I made it again next day for my family and finally I am here with the recipe of Daab Chingri; the way I prepare it. 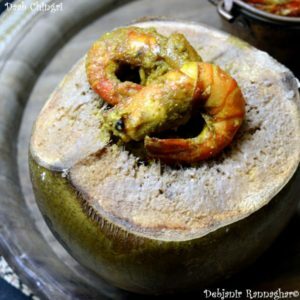 A traditional Bengali Delicacy where Prawn (preferably Jumbo Prawn or Galda Chingri) cooked within tender coconut along with the coconut flesh! Daab Chingri is one such thing that comes to difficult cooking at least to me if cooked properly without failing the authentic process of making it. This Prawn preparation tastes like heaven, though, the process of making it reminds me of hell 😀 . However, if finished properly this is something worth cooking and having for sure! Probably that is the reason I was trying to avoid writing it even but as they say better late than never. 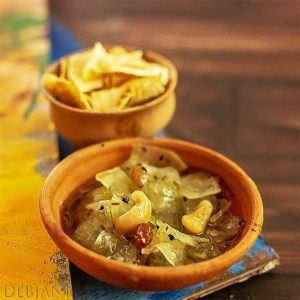 On this thought here is the recipe of Daab Chingri. 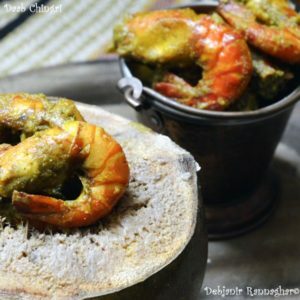 Though the spices used in preparing Daab Chingri are almost similar to the spices required in Chingri Maacher Malaikari or Prawn Malaikari but just because of the process of cooking both the dish taste completely different. I took around 1 kg prawn to make Daab Chingri and to prepare that I had 5 big sized Tender coconuts. I am going to share the recipe for 500 g Jumbo Prawn for which you need around 3-4 big sized tender coconut. Try to choose coconut with light flesh within. 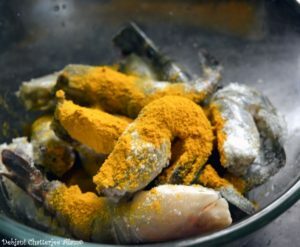 Though “N” requested use Galda Chingri but my personal preference is always Bagda Chingri…what else.. little Holud (turmeric) little Nun (salt) followed by a little dose of love and…. A signature Bengali delicacy where the Prawn cooked under Tender Coconut along with spices and coconut flesh; Daab Chigri is worth trying for! Garam Masala Powder: 1 Tsp. Red Chili Powder: 1 Tsp. Wash Tender Coconut and scoop upper portion of each Tender coconut and keep the scooped portions for further use. Strain the water from the coconut and keep 2 cup water aside for cooking the prawns. Leave the flesh of coconut as it is within. De-vein Prawns and wash 2-3 times under running water. 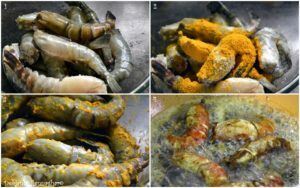 Marinade Prawns with half of the Turmeric Powder and ½ Tsp. Salt and leave for 15 minutes. Heat oil in a pan and fry Prawns one by one and strain from oil to use in next step. In remaining oil (after frying Prawns) add Ghee and heat properly. Temper the Oil and Ghee mixture with Bay leaf, Dry red chili, and Cinnamon and Green Cardamom. Add Onion paste to the tempering and cook till the paste leaves the side of the pan. At this point add Tomato paste, Mustard paste, and Ginger Garlic paste and cook until oil separates. Now add Coconut Milk and cook for 5 more minutes. Add Red Chili Powder, Turmeric Powder, Cumin Powder and Garam Masala Powder to the mixture along with Salt and Sugar and cook until the mixture leaves the side of the pan. Add 2 cup of coconut water and bring it to boil. When the mixture reduces to half add fried Prawns and cook for around 5 minutes and switch the flame off. Make a dough of the wheat flour. Set Oven in 180-degree c and pre-heat for 10 minutes. Fill each coconut with Prawns and gravy one by one. Try to not to overload the Tender coconuts. 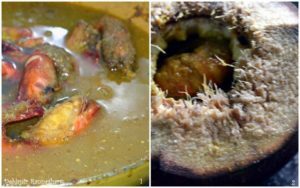 Now places 1 slit green chili over the prawns placed in the coconut and close the tender coconut with the scooped head and seal with the wheat dough. Place Tender Coconuts filled with prawn within the oven and in “Broil” mode cook for 40 minutes in 180-degree c.
Leave the tender coconuts as it is within oven until the temperature drops completely. Take Tender coconut out of the oven and break the seal using a knife. 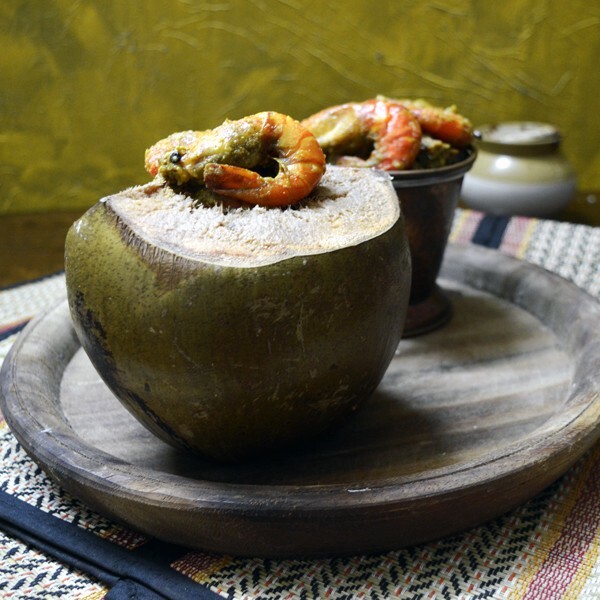 Very carefully take out the Prawn cooked under coconut with the coconut flesh or Daab Chingri and serve with hot steamed rice. In case Oven is not available place Tender coconut filled with Prawns within a pressure cooker before pouring 1 cup of water and cook with the lid and weight on for 2 whistles comes out. Only one coconut can be cooked if using a pressure cooker. Adding Mustard paste is optional but it enhances the taste. Same applies to Coconut Milk. Few more Seafood Recipes apart from Daab Chingri from Debjanir Rannaghar! Do try the Shutki Chingri Bhorta or the South Indian Prawn Curry or the Malabar Squid Curry or comforting Aloo Chingrir Shorshe Bata Diye Jhal and let me know your experience. « A Lunch out at Barcelos ; the house of Peri Peri and my take on Flame Grilled Portuguese delicacies!